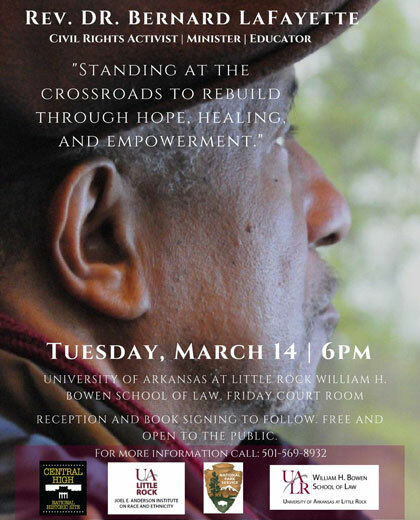 Join us at the UA Little Rock William H. Bowen School of Law, 1201 McMath Avenue, in the Friday Courtroom at 6 p.m on Tuesday, March 14, where Civil Rights Movement luminary, Rev. Dr. Bernard LaFayette, Jr., will talk about his life and experiences in the movement. LaFayette is a minister, educator, lecturer, and an authority on the strategy on nonviolent social change. He co-founded the Student Nonviolent Coordinating Committee (SNCC) in 1960, he was a leader of the Nashville Movement in 1960, a Freedom Rider in 1961, and participated in the1965 Selma Movement. He directed the Alabama Voter Registration Project in 1962, and was appointed National Program Administrator for the Southern Christian Leadership Conference (SCLC) and National Coordinator of the 1968 Poor Peoples’ Campaign by Martin Luther King, Jr. In addition, Dr. LaFayette served as Director of Peace and Justice in Latin America; Chairperson of the Consortium on Peace Research, Education and Development; Director of the PUSH Excel Institute; and minister of the Westminster Presbyterian Church in Tuskegee, Alabama.